The release of Google’s famed Chrome OS has certainly been eagerly awaited by many people with much anticipation for what the new open source operating system can bring to the table. As certain leaks have shown up in the past, a notebook running Chrome OS can actually be up and running in about 10 seconds and can wake up from sleep mode in less. In short, if there were anything that can be synonymous with the operating system, it would be a lot of speed. In fact, Kogan, an Australian computer manufacturer, went ahead and released the Kogan Agora Chromium laptop, the first notebook running the famed operating system a couple of months back to be touted as the world’s first Chrome OS notebook. Unfortunately, the specs of the Kogan Agora Chromium were so laughable that people did not line up to get one. Samsung followed suit with the release of their Samsung Series 5 Notebook, also running Chrome OS. Although packing some decent specs, reviews of the Series 5 were mixed and certainly not what the company was expecting. 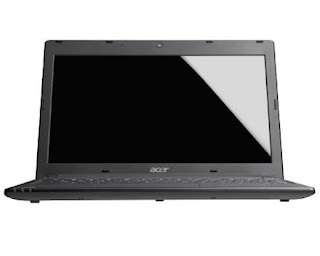 It is now the turn of Acer to supply the eagerly awaiting public with yet another notebook with Chrome OS with the release of their Acer AC700 Chromebook. Will it be different this time with Acer? What can the Acer AC700 Chromebook offer? Will it be as forgettable like the Kogan Agora Chromium? Join us as we take a closer look at the Acer AC700 Chromebook. A quick look at the aesthetics of the AC700 Chromebook will remind you of Google’s website whenever you pull it up: it is so bare. Some people might even go so far in calling the notebook an ugly slab of black plastic, which coincidentally is the material mostly used in the AC700 Chromebook’s construction. The AC700 Chromebook is very nondescript at 8.1 x 11.2 x 1 inch and based on my opinion went entirely against the promise of Acer that upon release, the AC700 Chromebook will have a sleek form factor. In the weight division, the AC700 Chromebook tips the scales at 3.2 pounds so it is light enough to carry around town. I guess Acer scrimped on the aesthetics of the device and instead focused on what is under the hood, which we will talk about shortly. To power up its operation, the AC700 Chromebook relies on a dual-core Intel Atom N570 processor clocked at 1.66GHz. This is basically the same processor that powers the Samsung Series 5 notebooks. 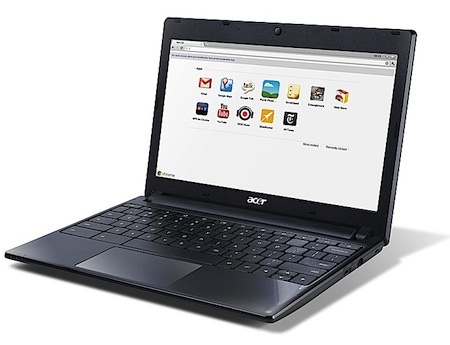 To complement the processor, the AC700 Chromebook has 2GB of DDR3 RAM for some speedy computing. The speed of the processes is enhanced further by the built-in 16GB SSD (Solid State Drive) to take care of your storage needs. People might think that 16GB might not be enough. It sure is isn’t enough but we are talking about a notebook here that runs Chrome OS where most of the work gets done in the cloud, including the storage of files and documents. Having said that, the 16GB more often than not won’t see much use especially if people would opt to have their files safely reside in the cloud. The AC700 Chromebook sports an 11.6-inch LED-backlit LCD that features Acer’s HD Widescreen CineCrystal technology for some HD goodness. We are expecting that the display of the notebook would have punchy colors that have lots of details along with good viewing angles and exceptional sunlight legibility. The feature set of the AC700 Chromebook includes an HDMI port so you can connect your notebook to an HDTV. It also has 2 USB 2.0 ports along with a 1.3-megapixel webcam for your video chats. It also packs a 4-in-1 multi-card reader and has support for Wi-Fi 802.11 b/g/using its InviLink Nplify adapter. Because this notebook is running Chrome OS which basically depend on web-based applications and cloud-based storage, it will be able to boot in 10 seconds or less because the operating system doesn’t have bloated code which other more traditional operating systems heavily rely on. In terms of battery life, the AC700 Chromebook has a 6-cell battery to power up its operations and according to Acer would last up to 6.5 hours of usage on a single charge before it dies out on you. The Acer AC700 Chromebook may not have the looks and 8.5-hour battery life of the Samsung Series 5 notebook but edges it out in terms of price tag where it is expected to fetch a price of US$ 349.99. Come to think of it, that is definitely cheaper than most Android-based tablets currently available in the market. As is the case, with the decent specs under its hood and the novelties offered by Chrome OS, the AC700 Chromebook will definitely be a hit. Could this spell out the decline in the tablet market? I guess we’ll just have to wait and see. Written by: Antonette Pineda, Tech Source’s gadget reviews and news correspondent. If you are considering Chromebooks but don't want to leave your Windows apps behind, you should look at Ericom AccessNow, a pure HTML5 RDP client that enables Chromebook users to connect to any RDP host, including Terminal Server (RDS Session Host), physical desktops or VDI virtual desktops – and run their applications and desktops in a browser. Ericom‘s AccessNow does not require Java, Flash, Silverlight, ActiveX, or any other underlying technology to be installed on end-user devices – an HTML5 browser is all that is required. I don't think tables will be left behind as long as Apple continue to produce newer versions of the iPad. I think the Chromebook might come in handy for people who would prefer to use full keyboards but can totally use web apps in their workflow. Hence they don't need the slower Windows netbooks. We probably have to wait for more Chromebook models before the manufacturers achieve the right blend of specs that consumers will love.